Membership is proposed by a Rotarian who is acquainted with the prospective member. A proposed member must be in a management or professional position. Once the prospective members application has been received, it is reviewed by the Club. Rotary looks for members willing to serve the community and world. The cost of Rotary membership includes a one-time initiation fee, dues and prepaid meals. Members pay about $225 a quarter, which includes about $60 per quarter in voluntary tax-deductible contributions to local charities and to the Rotary Foundation. 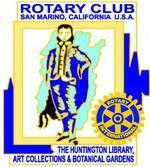 The San Marino Rotary Club was founded on April 12, 1939, by a group of San Marino business and civic leaders interested in serving the community. The club’s activities have ranged from rationing foods and guarding the skies during World War II to promoting computer and lifesaving skills in distant countries today. There’s always time for fun, too, with relaxed and informative meetings and social occasions. The Rotary Club of San Marino invites interested prospective members to attend a regular meeting and lunch, held each Thursday at 12:10 p.m. in the San Marino Community Church, Fellowship Hall, 1750 Virginia Road, San Marino, CA 91108. Parking is available in the lot south of the church. Map The meetings always conclude by 1:30 p.m. The Rotary International Website has additional information for prospective members.